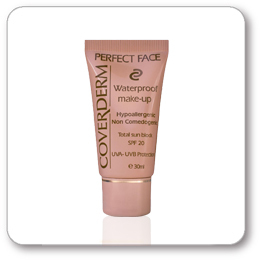 Waterproof and highly protective make up, provides a long-lasting, smooth, even coverage without clogging skin pores. Offers perfect coverage of acne, couperose, vitiligo, age spots, sun spots, or use as a long-lasting facial make up when you feel your facial skin tone pale. Ideal for anyone looking for a long-lasting (24hrs) make-up. 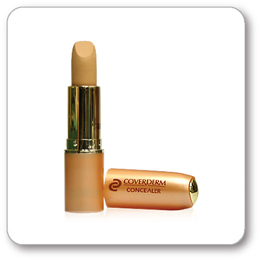 A medically approved and practiced natural-looking waterproof make-up that totally covers virtually any blemish or skin problems, no matter how severe the skin discoloration or damage is. 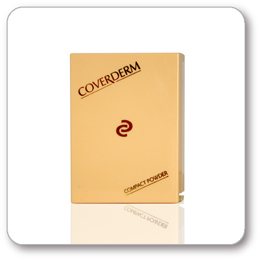 Coverderm Classic is a unique formula, a make-up and skin corrector in one, offering perfect camouflage of skin imperfections such as Angiomas, Psoriasis, Ichthyosis, Birthmarks, Scars, Burns, Tattoos. 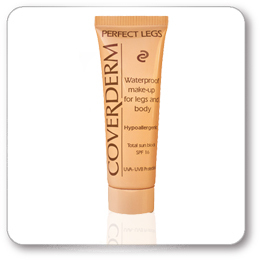 Hypoallergenic, waterproof make-up conceals any blemish or skin imperfection on the legs and body such as Varicose Veins, Stretch Marks, Phlebitis, Vitiligo, Scars, Burns, Dark Marks, Sunspots, Moles, Bruises and Tattoos. 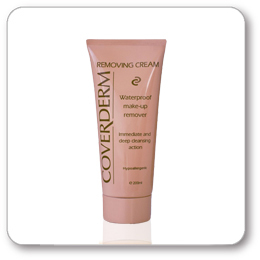 It also protects any sensitive areas against sunlight with SPF 16. It is extremely long-lasting (24 hours continuous coverage), sweat and smudge-proof body make-up that offers perfect coverage even when swimming or sweating for hours. 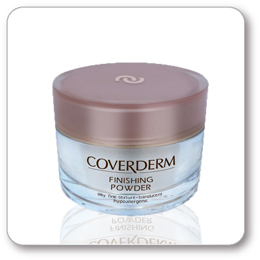 A loose, clinically tested hypoallergenic, translucent powder that guarantees a natural looking effect, giving a matte finishing without altering your make-up tone. 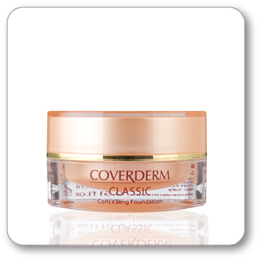 Long-lasting, waterproof concealment of dark eye circles and pigment spots (along with total sun protection SPF 30) and anti-ageing treatment (Vitamins A & E, Rosa Moschata). Specially formulated for coverage of dark eye circles and sun spots, is a clinically proven hypoallergenic and waterproof makeup. 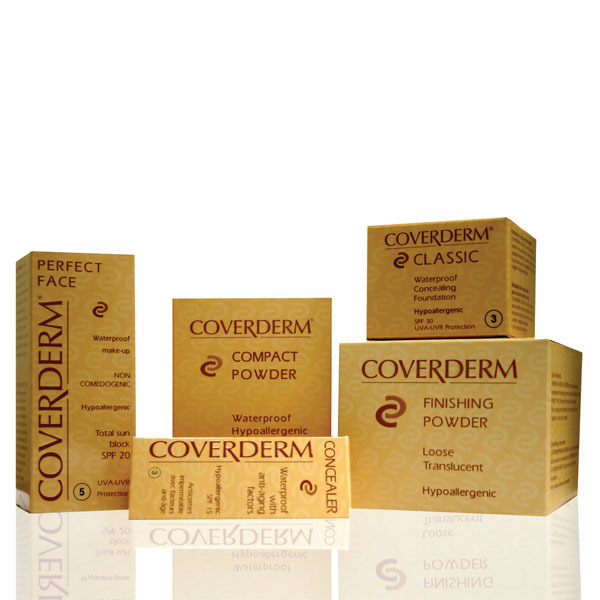 Waterproof coloring powders for all skin types making swimming possible yet does not irritate skin. A removing cream specially formulated to effectively remove waterproof makeup and at the same time offer your skin a deep cleansing. This clinically tested hypoallergenic cleanser does not stimulate sebum production. Also contains aloe - an effective soothing ingredient as well as special emollients to offer care even to the most sensitive acneic skin.